Today, Alfred Lord Tennyson's successor as the Poet Laureate, Alfred Austin (1835- 1913), is a largely forgotten literary name from the late Victorian and Edwardian worlds of yesteryear. 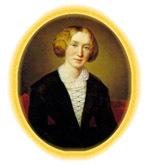 Austin's connection with George Eliot and G. H. Lewes will not be found documented in G. S. Haight's nine volume edition of The George Eliot Letters (New Haven, 1954-78) and his name does not appear in its index. The Autobiography of Alfred Austin Poet Laureate 1835-1910 (2 vols., 1911: reprinted AMS Press, New York, 1973) does refer to meetings between George Eliot, George Henry Lewes and Alfred Austin. G. H. Lewes the editor of the Fortnightly Review published Austin's 'Notes Curious and Critical made at Perugia', November 1866, pp. 666-81. Like that worst foe, a vain splenetic friend? If that thy utmost stature prove too small? Though thou be dwarf, some other is more tall. The foremost drop; on, those behind must press. What boots my doing, so the deed be done?